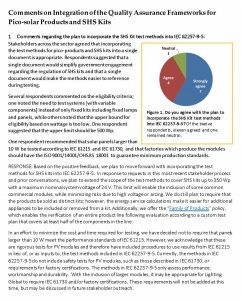 We are now working to integrate the test methods for pico-products and SHS kits into a single quality assurance framework that covers off-grid energy kits with PV power up to 350 W.
In June 2016, we requested feedback on our initial proposal and received multiple comments from twelve stakeholders and organizations that helped improve the proposed framework. We believe the proposed framework will create a unified set of test methods, institutionalized as IEC/TS 62257-9-5, that can more easily be maintained and will ensure a more efficient and appropriate testing process. If you have any questions, please contact qa@lightingglobal.org.